Are we there yet? We have all patiently waited for the lull of grey skies and dreary cold days to pass & the prediction of the grand ground hog have already faded. Time has shifted back into a solstice where our memories are vivid; the grass was green, the days are long, and things to do are not lacking. In this area of the country, the average temp for March 25th is 52 deg. Today, 2014, we enjoyed a brisk high of 39 deg as we watched snow flurries waste the day away. It is time to put away the thick over coats and deal with new decisions. Such as, it is too nice to stay around the house today it is time to go have some fun. Decisions like, cut the grass or go to the lake, park, concert, etc. Which brings us to the real question at hand; why hire a landscaper? Other than the obvious reasons like you work hard, and now is the time of year to play hard there are several key benefits to consider. 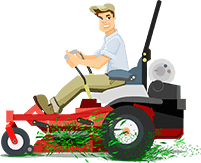 Consider the opportunity costs: depending on the size of your yard and the degree of maintenance you need most southern markets have an average price of $30 for lawn care. In the Nashville market, you end up with on average 30 cuts a year. You could spend anywhere on retail average from $400 to $1200 for a push or riding lawn mower. Then, of course add-in the maintenance cost & let us not forget you will need an edge trimmer too. Or, you could be like my Dad and go buy a mower for $100 bucks used, then complain about how much time & money you have to sink into it every single week when it is time to mow the grass. Let us review the constants; spring & summer goes by too fast, the grass is going to grow, your neighbor is going to complain when it gets tall, there will things you rather do, & Nashville has an abundance of local lawn care pros that can provide a great experience and a fair price to cut your lawn. Your time, like mine is treasured, go enjoy what it is you like to do and hire a landscaper.